As some of you may know, during the entire month of July, I created a Facebook Project called, “31 Days of Orvieto”. About half-way through the month, however, I suddenly realized that many of Orvieto or Bust’s followers aren’t on Facebook (or haven’t ‘friended’ me YET – hint, hint). In order to rectify the situation, I’ve decided to repeat the project here during the month of August. If you’ve already seen the posts on Facebook, I want to apoligize in advance for the duplication. For those who are seeing “31 Days” for the first time, I hope you’ll enjoy them at least half as much as I’ve enjoyed creating them! 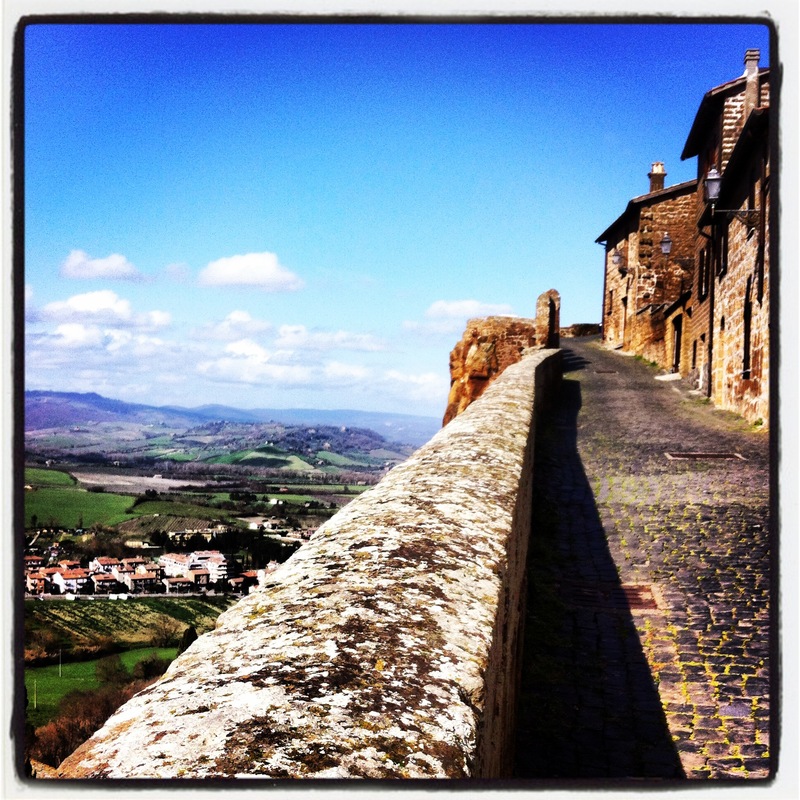 It’s DAY 1 of “31 Days of Orvieto”! I have a theory that if people knew about Orvieto and it’s splendors, they would certainly come to visit us. Tourism is down in our little town, so I’ve decided to start a campaign to spread the word about Orvieto’s greatness. You know me – I’m all about promoting my adopted home – so every day in the month of August, I will post an article, a photo, a story, a tid-bit about this wonderful place. If you love Orvieto and/or would like to support my efforts, please take a moment to read, and if you are so inclined, share the posts and, in doing so, help me create an “Orvieto buzz”. Go, Orvieto, Go!!!! 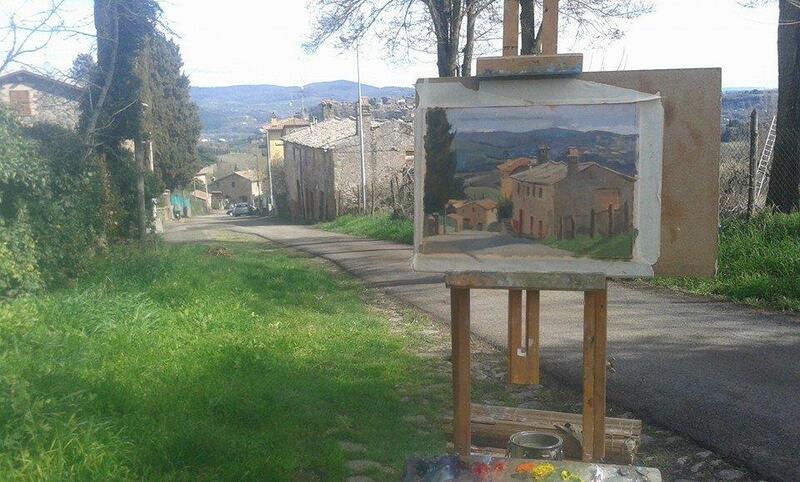 I begin with my 2011 homage to this place that I love so much…Orvieto, Italy: A Land Where Time Stands Still. I don’t know much about wine. I’m not an expert on classical art and, although I live in Italy, I’m the antithesis of a “foodie”. However, when it comes to giving my opinion about a glass of red, a painting in a gallery or the dinner on my plate, I’m quite certain of three things: 1) I know what I like, 2) I recognize beauty when I see it, and 3) I can tell when a meal tastes delicious. It’s the same with a book. I’ve never actually written one, but I know a good novel when I read it. Halfway into the first chapter of Laura Morelli’s The Gondola Maker, I found myself wondering if the author had a time machine. I suppose a historical novel should transport the reader to another time and place, but Ms. Morelli’s use of crystal-clear imagery and her microscopic attention to detail went above and beyond. I’d be putting it mildly if I said she’d done her homework. The Gondola Maker’s story swirls around a young protagonist, Luca Vianello – a boy on the brink of adulthood. Born into a long line of gondola craftsmen, he works alongside his father and brothers in the family’s boatyard and never allows himself to imagine a future beyond the one that has been chosen for him. But following one single, blinding moment of rage, the direction of his life is altered forever and Luca must set out on an odyssey through the dark underworld of the Most Serene Republic of Venice. As he slowly picks up the pieces of his shattered life, he finds his true passion and destiny and, in the process of discovery, comes full circle. 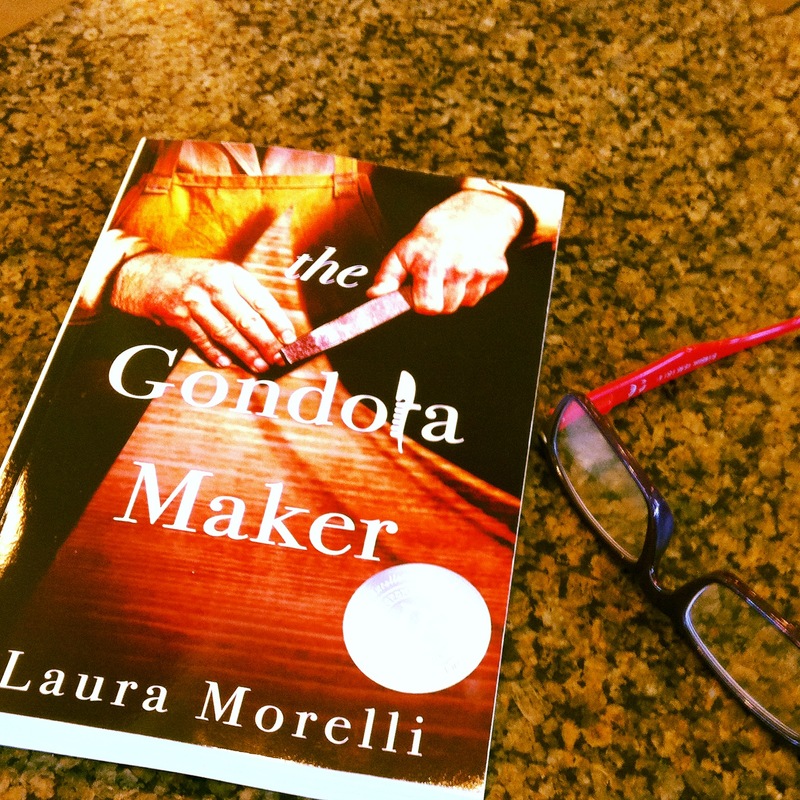 As Laura Morelli spins her intriguing and authentic Renaissance tale, she brings to life the time-honored artisan trade of gondola making and reminds us that if not preserved, this centuries-old craft and others like it will be lost forever. Find her here website or on Facebook and Twitter. I want extend my sincerest gratitude to Laura Fabiani of Italy Book Tours for inviting me to participate in my first book review event. Second, a huge “Grazie” to the author, Laura Morelli, for allowing me the privilege of reading and then sharing my thoughts about her novel. It takes talent, fortitude and sheer guts to write a book. 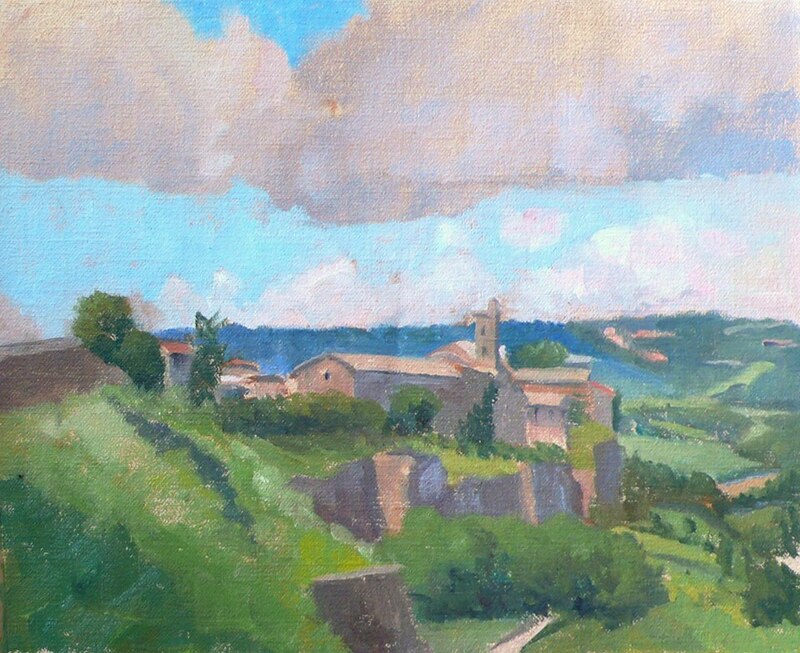 It goes without saying that painters of landscapes love the outdoors, but for one American-turned-Roman resident, plein air painting isn’t only a passion, it’s a way of life. 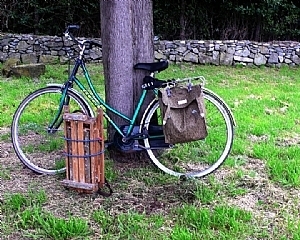 Riding around the Eternal City on her “tricked out” bicycle – two saddlebags swinging in the wind and trusty easel strapped to her back – it’s just another day at the office for artist Kelly Medford. I met Kelly outside a book event in Rome last fall. mistaking her for a college student studying abroad. Perhaps it was her fresh face and wide-eyed exuberance that makes Kelly seem much younger than her years. But make no mistake about it, this petite powerhouse of a woman is an accomplished painter with serious credentials. 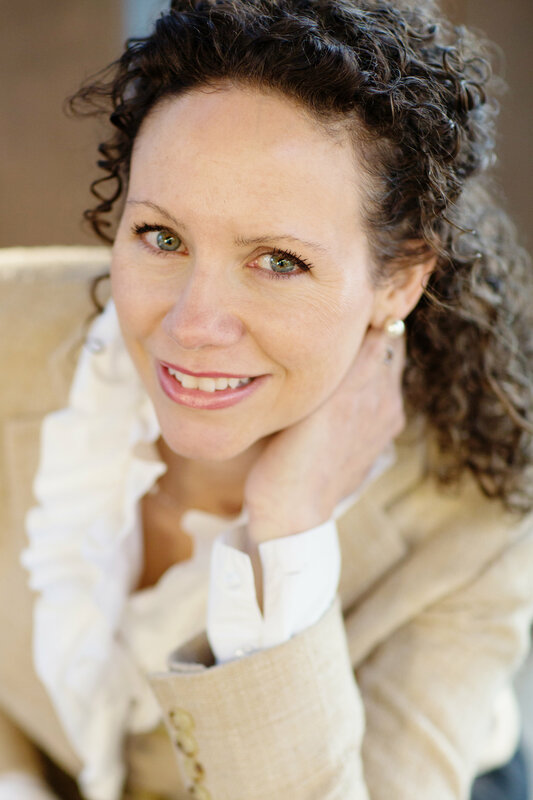 Kelly grew up in Washington, D.C., the only child of two left-brained scientists. Her emotional, expressive and free-spirited nature set her on a different path with its share of serendipitous forks in the road and twists of fate along the way. Fortunately for us, Kelly’s travels eventually landed her in Italy where she studied at the prestigious Florence Academy of Art. It was in the Renaissance capital that she spent a year of intensive training in classical figurative drawing; honing her skills and developing her techniques. 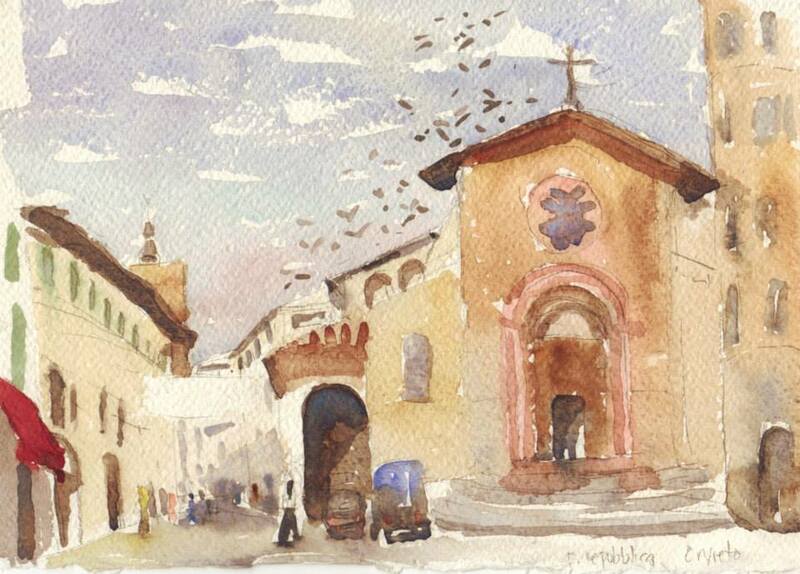 Painting indoors made Kelly feel isolated and itching to spread her wings so, in 2010, she traded the dimly lit, heavy-curtained and controlled environment of Florence for the warm, golden sun-soaked locations of Rome. 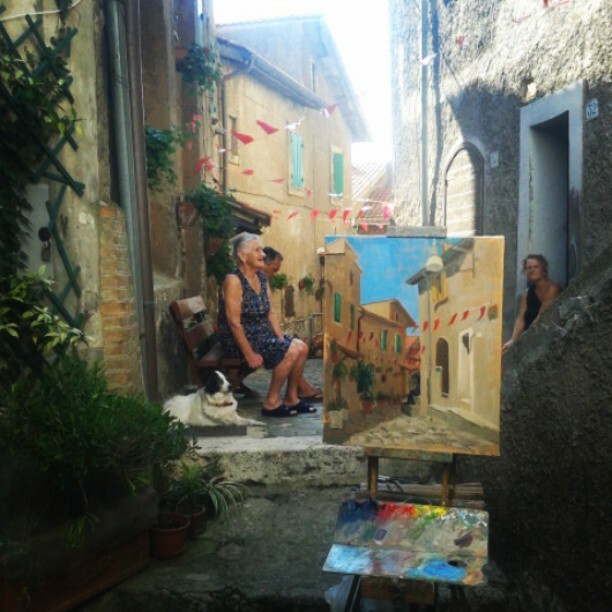 You’ll most likely find Kelly on a tiny lane or hidden piazza painting evocative canvases of Roman life or its surrounding countryside. No Experience Necessary. No Erasers Allowed. 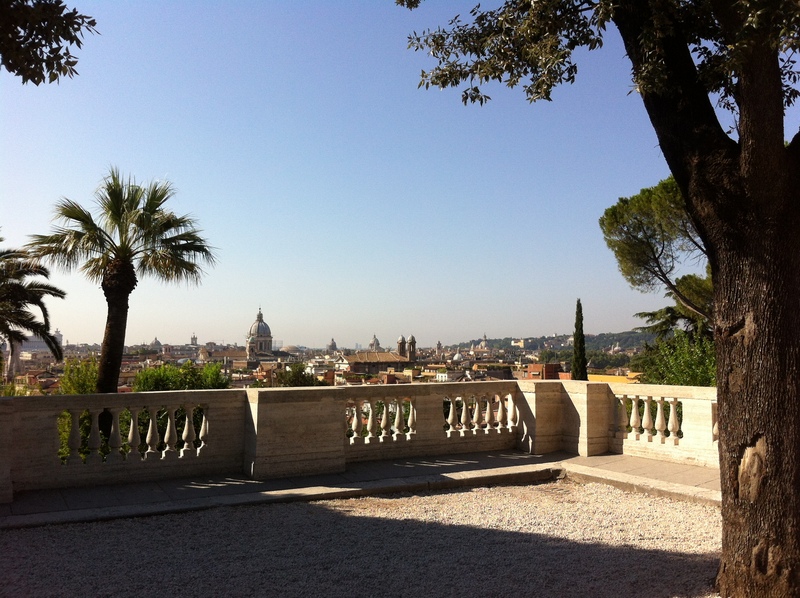 I recently met up with Kelly and her sketch group at her early-morning classroom, the Pincio balcony adjacent to the Villa Borghese gardens. 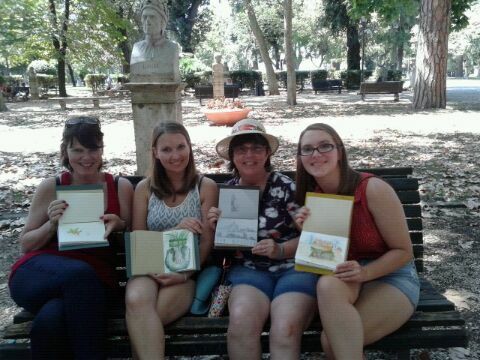 My fellow students were Joanie, a teacher from Palm Springs (paints in her spare time), and daughters Becca (likes art a lot) and Vanessa (an excellent doodler). 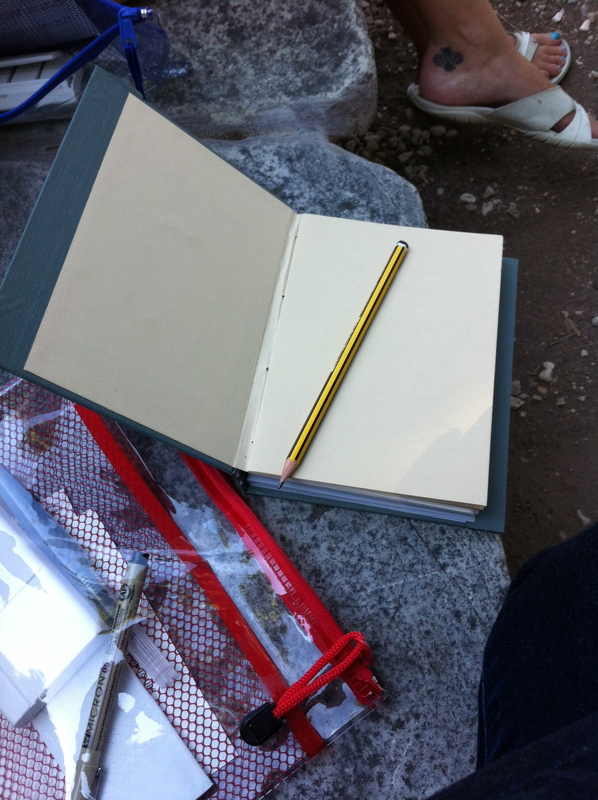 Following a brief, but enlightening lesson on technique and tips for using our handmade-by-Kelly sketchbook and kit, we fanned out to draw…rocks, leaves, signposts, statues…I was having so much fun I didn’t want the tour to end. Sadly it did end, but not before gathering as a group for a little show and tell. Memories, as I learned from Kelly, are extra special when you can hold them in your hand. How often do I get to say this sentence? The event was hosted by the amazing talent and Caravaggio lookalike, ceramic artist Marino Moretti. Inside his studio, located in a partially restored 9th-century castle in the town of Viceno, people gathered for a pre-holiday brindisi (toast). I tagged along with my friend, textile conservator and dealer, Igor Honkanen and was pleasantly surprised to see other friends who were in attendance. 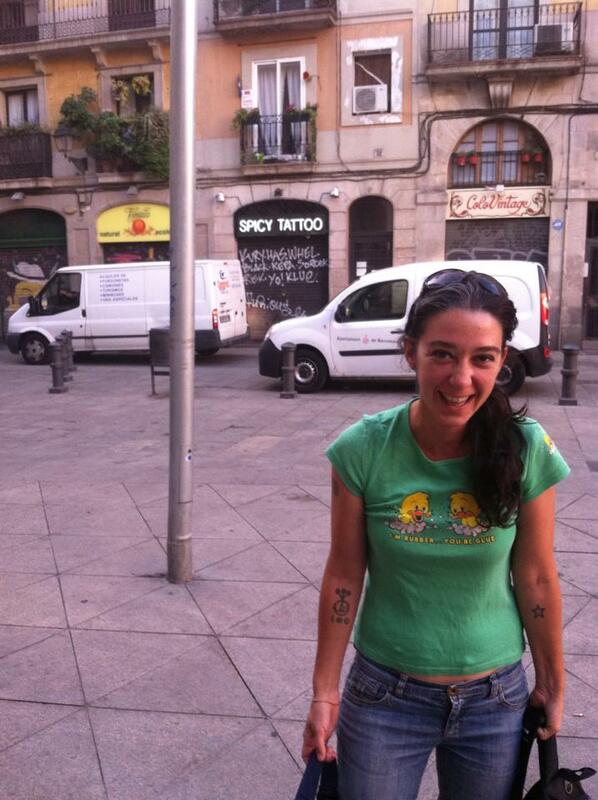 I was the new girl in town – well not really. Two guys were hunched over in intense conversation in front of the fire, and Igor split off to talk to some other people, so I wandered around the hall in awe of all the colorful pottery surrounding us. Marino’s lovely wife Marilyn was such a gracious hostess and the couple’s handsome teenage son acted as the bartender. I was trying to play it cool, but the phrase kept repeating in my head, “I am in a castle, I am in a castle, I am in a castle”. As for Marino’s works, they are quite particular. His pieces fall mostly in the category of Majolica ceramics, but what I really want to say is that they’re in a class by themselves. Majolica is a traditional way of tin-glazing pottery that dates back to the 13th century. The technique uses vibrant colors and often depicts historical figues and tells legends through figures and scenes. Moretti’s creations come in earthenware, terracotta and porcelain. Since the 1970s, Marino has gathered quite a large and loyal following. Tonight the main room was filled with his whimsical pottery displayed in groupings of vases, bowls and platters. In the corner were spindly garden sculptures. Handpainted tiles of yellow, blue, green and red hung like Renaissance calling cards. Happy medieval figures danced around the outside of bowls and ancient fish swam across platters. Even a crazy man was biting his own tail; it’s serious art that doesn’t take itself too seriously. I found my way into the potter’s workshop where small cups and vases were perched on simple wooden shelving. I took a deep breath before attempting to pick up a tiny espresso cup with a medieval man’s head on it. I lifted it gingerly, careful not to bump it against the other cups or drop it. It seemed so precious and delicate. I admired it and felt how light it was in my hand. If I owned this cup, I don’t think I could bear to drink coffee out of it! It might be just a little cup and saucer to some people, but to me it’s a fine work of art.